See that? Not sure what you’re looking at? Let me help you. See that black dot the size of ant? Yeah. I opened my car door while putting my baby in the car and accidentally nicked this other person’s car. So happens, this lady was right there. I was buckling EJ up, giving him some water, wiping his hands. Then here she comes, rapping on my window. When I opened the door, she asks where was my mom! Lol!! I guess I still look like a teenager? I don’t know if I should be flattered or not?! 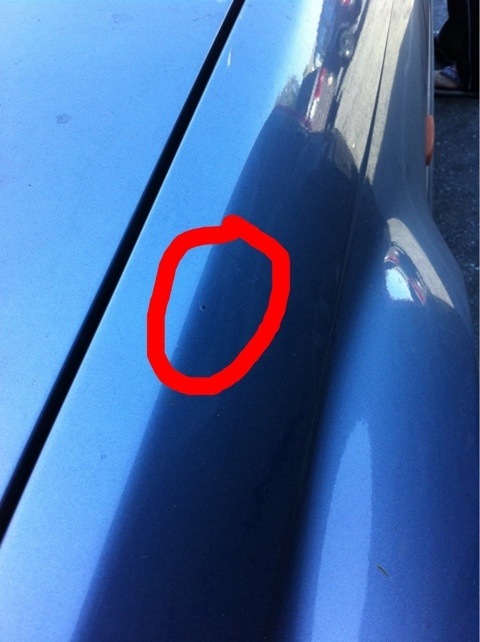 Then she starts yelling at me about how I scratched her car and how that’s gonna cause her car to rust…. Blah blah blah. I used a baby wipe and wiped off most the plant residue left from my car door. What can I say? I did it. But the yelling wasn’t necessary!! I’ve never met such a petty, calculating, and rude person in my life! Guess I haven’t seen much of the world, huh? Most of her yelling was gibberish, ie, I couldn’t understand her through her thick China accent. But basically she wanted to take out an insurance claim. I gave her my insurance agent’s name and phone number. My insurance agent told me to take a photo of the ‘damage’, take down her name, and year and model of her car. She kept saying “It’s a BMW, it’s a BMW.” Yeah… Obviously. Hello? Year and model?? It’s a 2001. It’s a 10-year-old car!! Really? The wear and tear on the car is worse than that little dot! Is it really worth all your time and effort to go through the whole insurance process, take your car into the shop, and all the flurry over a tiny black dot? Whatever, in the hands of my insurance now. I hope this better not affect the rate of my insurance next year! Over a little black dot!! Anyhow, I was super upset after the incident. I hadn’t been yelled at like this since I was a kid by my parents. I felt stupid, should’ve been more careful. I was just balling my eyes out as I was driving home. I thought I was tough. But not so much, I guess. Over a stupid incident. Then as I was waiting at a stop light, there was this homeless man, holding up a sign, asking more help. I’ve never given money to homeless people on the street like this before. I decided, this will be my first time! So, I gave him $5. I figured, service makes you happy and feel better about yourself, right?? $5 is not much, counted as a little service, right? I hope he doesn’t go and buy cigarettes or alcohol with it. Yeah, but I did feel a little better about myself. 3) Service brings a smile. 4) I can still pass off as a teenager!